Nothing new here for those of you who follow similar sites, just posting this to have it included on this site too. Compact fluorescent light (CFL) bulbs can provide the same amount of lumens as incandescent light bulbs, using one quarter of the energy. Recently, CFL exposure was found to exacerbate existing skin conditions; however, the effects of CFL exposure on healthy skin tissue have not been thoroughly investigated. In this study, we studied the effects of exposure to CFL illumination on healthy human skin tissue cells (fibroblasts and keratinocytes). Cells exposed to CFLs exhibited a decrease in the proliferation rate, a significant increase in the production of reactive oxygen species, and a decrease in their ability to contract collagen. Measurements of UV emissions from these bulbs found significant levels of UVC and UVA (mercury [Hg] emission lines), which appeared to originate from cracks in the phosphor coatings, present in all bulbs studied. The response of the cells to the CFLs was consistent with damage from UV radiation, which was further enhanced when low dosages of TiO2 nanoparticles (NPs), normally used for UV absorption, were added prior to exposure. No effect on cells, with or without TiO2 NPs, was observed when they were exposed to incandescent light of the same intensity. Double envelope CFLs do reduce UV emissions considerably and should be used in any situation where lamps are at all close to people like task lighting, table lamps and bedside lights, particularly for the very young and very old whose skin tends to be more sensitive. Which are less efficient and durable than naked CLF tubes. I’d recommend a frosted incandescent bulb for those tasks instead, if you have any hoarded. Or try a halogen PAR floodlight if directional lamps are suitable for the luminaire (light fitting). Or a warmwhite LED of highest quality if you can afford it. Money saving, compact fluorescent light bulbs emit high levels of ultra violet radiation, according to a new study. Research at Long Island’s Stony Brook found that the bulbs emit rays so strong that they can actually burn skin and skin cells. In every bulb that researchers tested they found that the protective coating around the light creating ‘phosphor’ was cracked, allowing dangerous ultraviolet rays to escape. Homeowners expressed concern over the effect that the bulbs could have on children. “That’s very unfortunate because the kids are getting exposed to so many different things at a younger age,” said Vicky Cobb. Last year The Telegraph reported on cancer causing chemicals in CFLs. The bulbs are already widely used in the UK following EU direction to phase out traditional incandescent lighting by the end of this year. But the German scientists claimed that several carcinogenic chemicals and toxins were released when the environmentally-friendly compact fluorescent lamps (CFLs) were switched on, including phenol, naphthalene and styrene. “Andreas Kirchner, of the Federation of German Engineers, said: “Electrical smog develops around these lamps. I, therefore, use them only very economically. They should not be used in unventilated areas and definitely not in the proximity of the head. Electro-smog is a different issue altogether, but good advice anyway. British experts insisted that more research was needed and urged consumers not to panic. The Department for the Environment insists the bulbs are safe, despite the fact that they contain small amounts of mercury which would leak out if the glass was broken. Advice on its website states: “Energy efficient light bulbs are not a danger to the public. “Although they contain mercury, limited at 5mg per lamp, it cannot escape from a lamp that is intact. To my knowledge, no such independent studies have been made, and the UK Department for the Environment, Food and Rural Affairs (DEFRA) still has no cautionary warnings on their website CFL page (last updated 29 October 2009). And the issue was not about mercury but about phenol, naphtalene and styrene. “It is unlikely that any EMF emitted from CFL or other fluorescent lamps would contribute to electromagnetic hypersensitivity [Evidence level A]. However, any possible health problems related to flicker and UV/blue light emission are minimized, if CFL are equipped with functional high-frequency electronic ballasts, double envelopes and adequate coating. Unless double-envelope CFLs become mandatory everywhere and naked CFLs get banned for health reasons, this only gives UV-sensitive patient groups relief in environments they can control themselves, and still doesn’t solve anything for all those who react to CFLs due to other factors than UV. • We also have the elderly who need more light quantity than a young person. At 60, a person needs about 7 times more light than a child or teenager in order to see as well, and more with increasing age. All who need more light may not be comfortable with CFLs which give a dimmer and more diffused light and which may also emit UV unless in a double envelope. To ban 100W, 75W and then 60W incandescent bulbs may be especially detrimental to those who need more light. • Good light quality is also as essential for people over 65 as enough quantity, as the lens tends to get somewhat dulled and clouded with age. This gives a lowered contrast perception and colour vision so that colours will look paler. The poor colour rendering of standard CFLs will exacerbate this problem, whereas bright incandescent or halogen light will mitigate it. • The ageing lens will also scatter light, like sunlight through a scratched windshield, with increased sensitivity to glare as a result,  making the ban on frosted bulbs particularly detrimental for those who need bright incandescent light to see colours well, but in a non-glaring bulb. • For reading, the frosted bulb is also the best option as it lights the book smoothly, whereas clear bulbs and halogen spotlights with clear glass create distracting concentric light patterns on the page. • Then we have all those who just dislike CFLs due to their inferior light quality and unpleasant feel. Especially women [3, 4] (a rather large group!) as well as many lighting designers, artists and others with sensitive colour perception. While these last groups may not get ill from FL/CFL light, sensitive people may still feel decidedly uncomfortable and or unhappy with a poorer quality light. Isn’t light an essential nutrient, just like water and food? 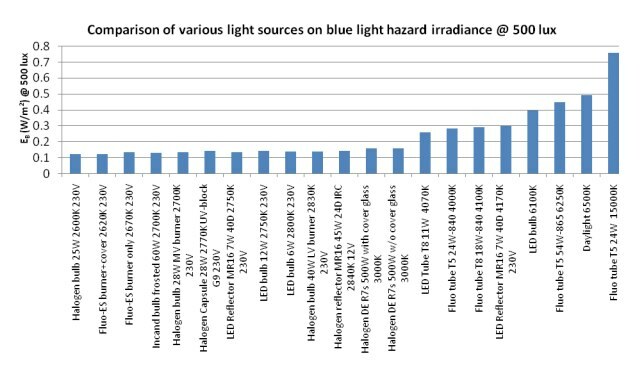 Top quality light (= natural daylight, firelight, incandescent and halogen light) could be compared with organic food or spring water, whereas FL, CFL, HID and LED light is like processed food or tap water. Some may not mind a lower quality, while others are very sensitive to it and willing to pay more for something that feels so much better.